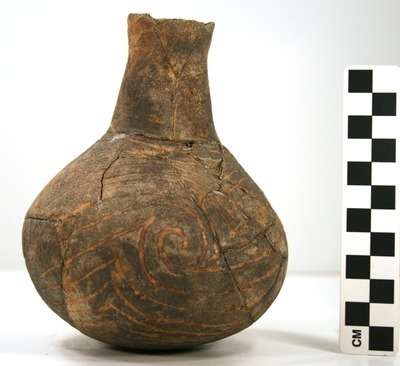 "41UR315, Burial 38, Vessel 221" by Timothy K. Perttula and Robert Z. Selden Jr.
DECORATION (INCLUDING MOTIF AND ELEMENTS WHEN APPARENT): The vessel body is covered in four repeating engraved curvilinear scrolls that end in a hooked arm element. On either side of the hooked arm element are concentric curvilinear scrolls that extend from the top of the vessel to just above the base. Taylor Engraved bottle, Vessel 221, Burial 38.